Many, many years ago we signed up to get a CSA (Community Supported Agriculture) with my brother and sister-in-law. We would get all kinds of interesting vegetables. Some of them we had never come across before and had no clue what to do with them. We didn’t receive any information with the baskets at all. So when we got a leafy green in the basket and had no clue what to do with it, we turned to the internet to look up pictures of all leafy greens to find a match. Well, we found it. It was kale. I now see kale everywhere! Not only do I see kale everywhere, but we eat it quite often. But since I wasn’t brought up eating it and didn’t have a clue what to do with it that first time, we had to find a recipe that would work. I tried making it like spinach, and was a little put off by the texture (I am a texture person). Then with the next basket of veggies, I tried this recipe and was very pleased with the results. Preheat oven to 400°F. 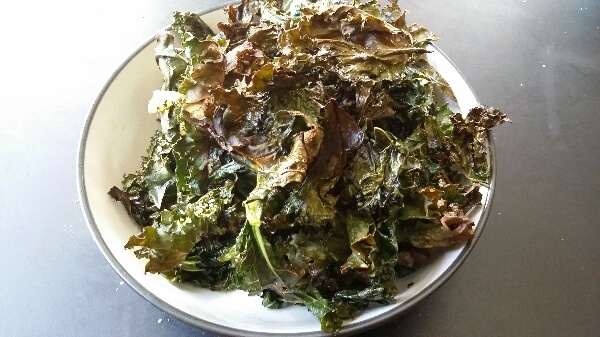 Wash the kale really well and roughly chop it up. Put it on a baking sheet and dry it with a paper towel. 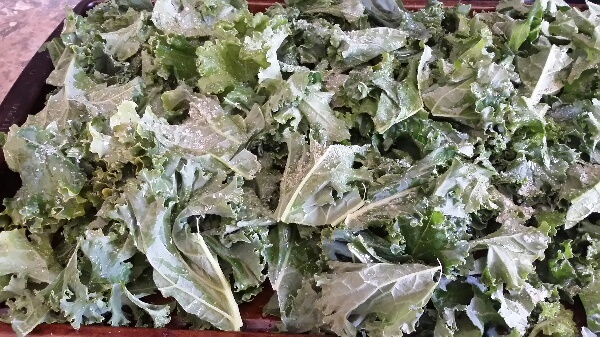 Drizzle the kale with olive oil and sprinkle lightly with garlic & salt. Bake for 15 minutes. Check every 5 minutes or so to toss the leaves so they crisp evenly but don’t let them burn. We haven’t gotten the kids to love this as much as us, but they will come around.